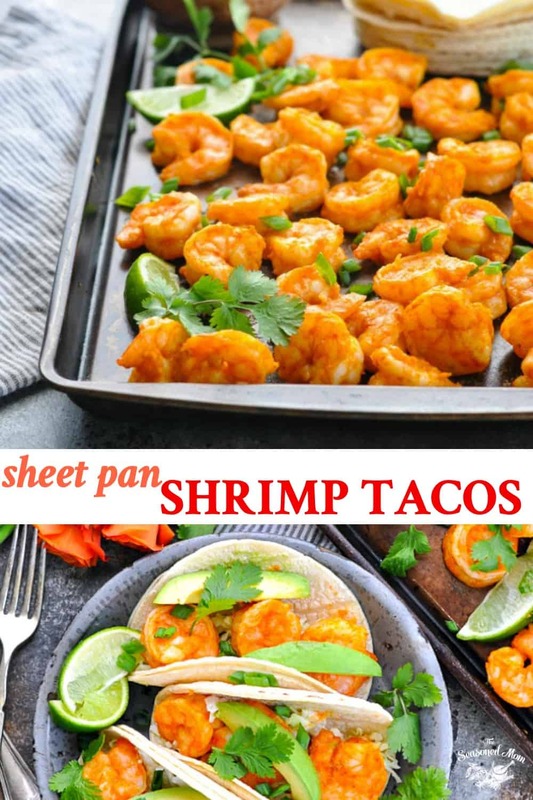 Not only are they delicious, but these simple and healthy Sheet Pan Shrimp Tacos bake on one tray and are ready from start to finish in less than 30 minutes! 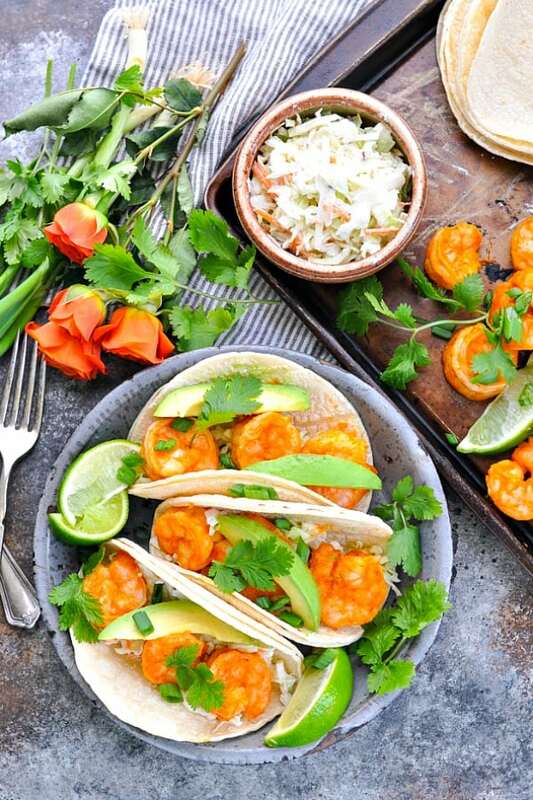 You’ve probably tried beef tacos, chicken tacos, and maybe even fish tacos…but have you ever tasted shrimp tacos? 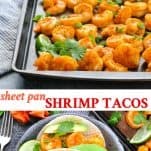 Not only are they delicious, but these simple and healthy Sheet Pan Shrimp Tacos bake on one tray and are ready from start to finish in less than 30 minutes! With quick clean-up, nutritious ingredients, and kid-friendly taste, it’s a weeknight dinner that will become a regular in your meal planning routine. 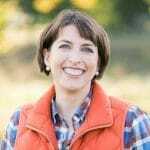 If you’re like me, then you’re probably on a constant quest to find easy and kid-friendly ways to add more seafood to your diet. 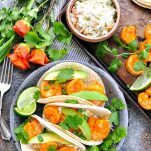 What better way to introduce the little ones to the tender, mild shellfish than these easy Shrimp Tacos? 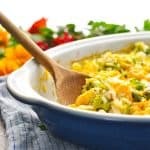 By combining familiar flavors with a few new ingredients, you’ll take the intimidation factor out of the “unknown” with a healthy twist on the classic favorite. If I’m going to prepare shrimp, the recipe better be EASY. Otherwise they’ll just be stashed in the freezer and forgotten! Fortunately, these Shrimp Tacos only require a few minutes of hands-on time. Shall we get started?! First, you’re going to whisk together your 3-ingredient marinade: olive oil, taco seasoning, and lime juice. While the shrimp marinate and your oven preheats, stir together a light and fresh cabbage slaw for your Shrimp Tacos. I love the contrast of the cool, crispy, creamy garnish when paired with the warm, zesty shrimp. 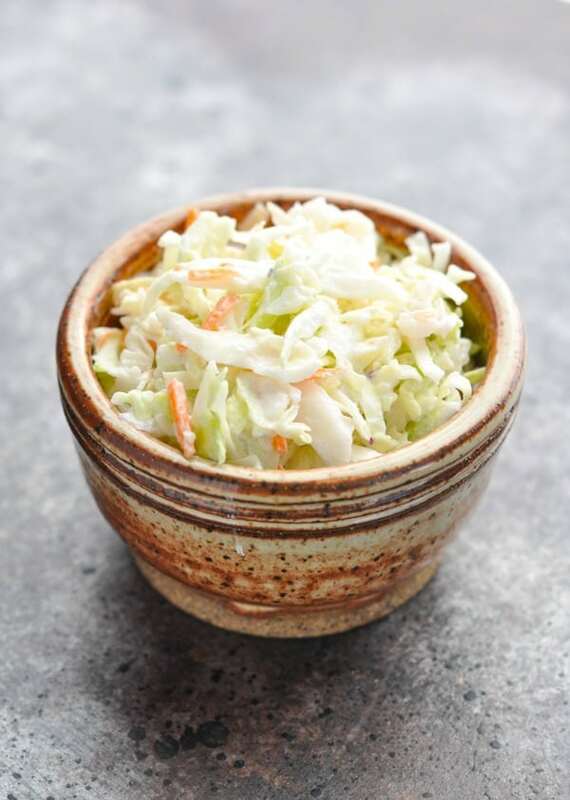 Again, you only need a handful of ingredients for this slaw: a bag of coleslaw mix (or shredded cabbage), Greek yogurt (or mayonnaise), lime juice, honey, salt and pepper. The shrimp roast in a 400-degree oven for about 10 minutes. Don’t forget to wrap the tortillas in foil and warm them in the same oven during the final 5 minutes! A squeeze of fresh lime juice finishes off the shrimp as they come out of the oven, and then it’s time to assemble! 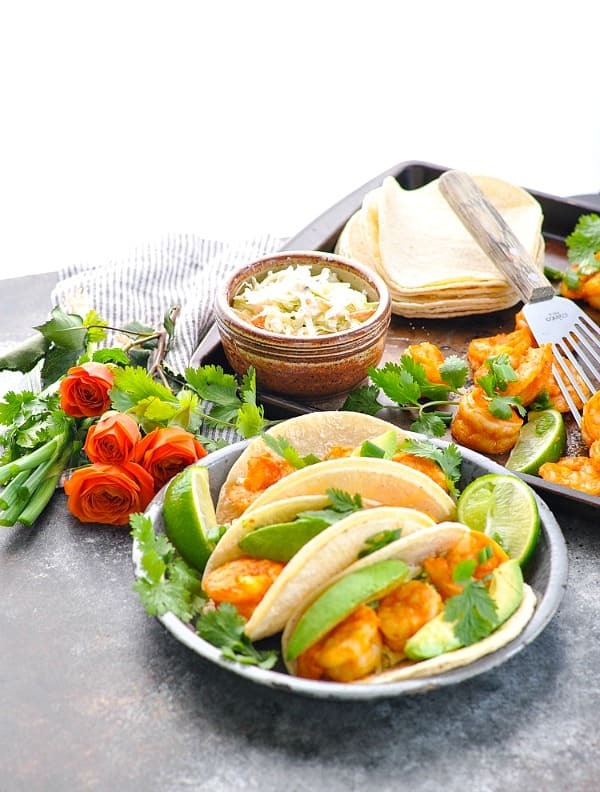 Shrimp tacos are completely customizable, so you can prepare each serving to suit the individuals at YOUR dinner table. Mix up your next Taco Tuesday with a fresh, light, and healthy seafood supper that your whole family will enjoy. 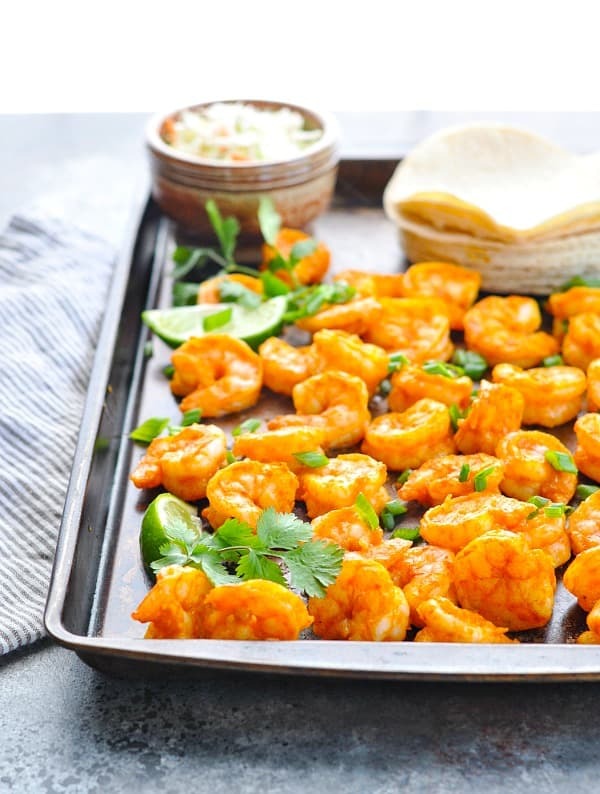 Best of all, your Sheet Pan Shrimp Tacos are a quick option with minimal clean-up! You can use fresh shrimp or frozen shrimp that you thaw in the refrigerator overnight. To thaw frozen shrimp quickly, place them in a colander and run them under cold water. Enjoy these shrimp tacos warm from the oven, or serve them at room temperature. 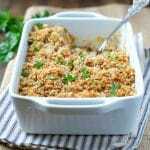 It’s an easy meal to prepare in advance, and you can even enjoy leftovers cold! Don’t want cabbage on your tacos? Substitute with plain shredded iceberg lettuce instead. Cooking just for Two? Cut the ingredients in half! The rest of the cooking instructions remain the same. 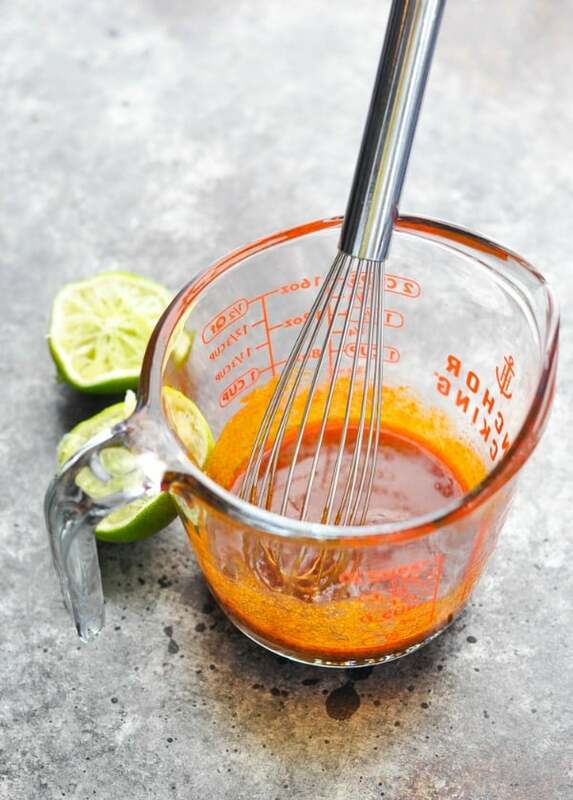 In a glass measuring cup or small bowl, whisk together olive oil, taco seasoning, and juice from 1 lime. Place shrimp in a large zip-top plastic bag and pour marinade over the shrimp. Seal the bag and toss to coat. 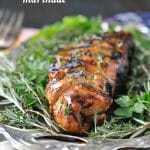 Marinate for about 10-15 minutes while you wait for the oven to preheat and while you prepare the slaw. Spray a foil-lined baking sheet with cooking spray and set aside. While the shrimp marinate (and while the oven preheats), prepare the slaw. In a large bowl, whisk together Greek yogurt (or mayonnaise), juice from 1 lime, honey, salt and pepper. Add the coleslaw mix to the bowl and toss until the cabbage is evenly coated with the sauce. It will look fairly dry initially, but as the slaw sits, the cabbage will absorb the sauce and it will become very moist. You can always add more lime juice or yogurt just before serving, if necessary. Set coleslaw aside. 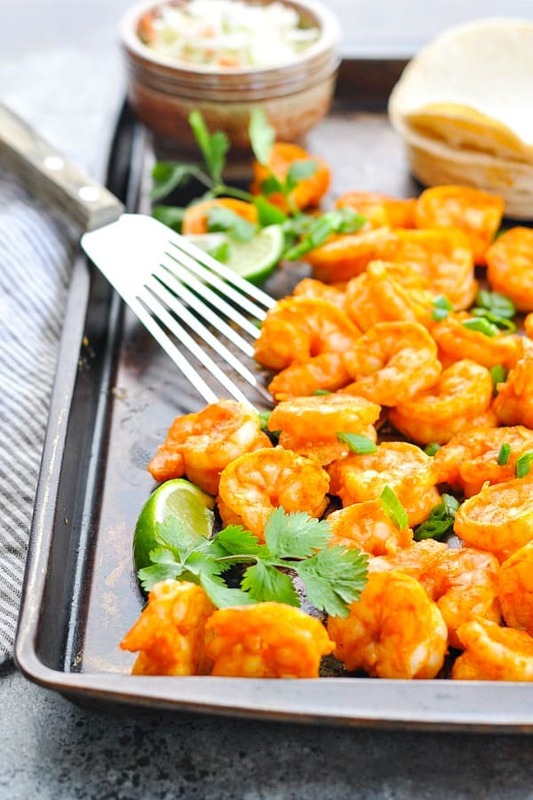 Remove the shrimp from the marinade and spread in a single layer on the prepared baking sheet. Roast shrimp for 10-12 minutes, or just until pink, stirring halfway through. Be sure to keep an eye on the shrimp so that you don’t overcook it (or it will be tough). Wrap tortillas in foil and warm in the oven during the final 5 minutes of shrimp cooking time. Remove from oven and squeeze juice from remaining lime over top. Toss to coat. Fill warm tortillas with shrimp and slaw. Garnish with desired toppings! 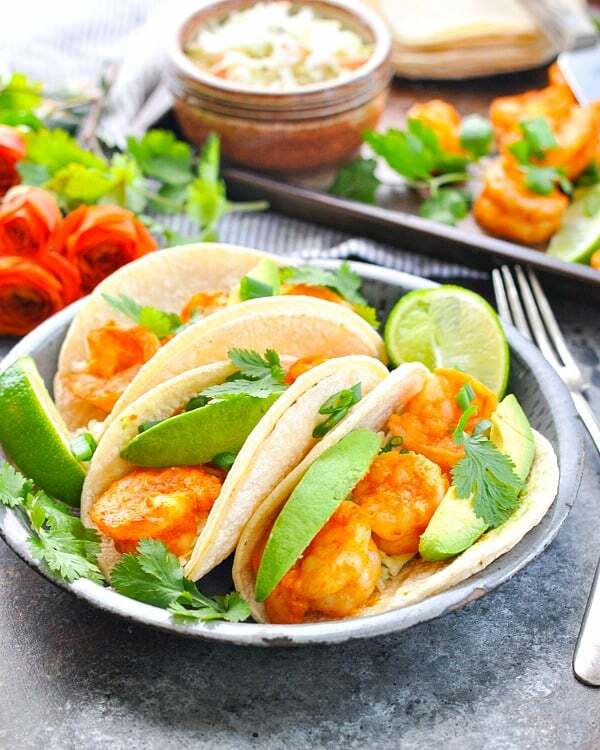 Enjoy these shrimp tacos warm from the oven, or serve them at room temperature. 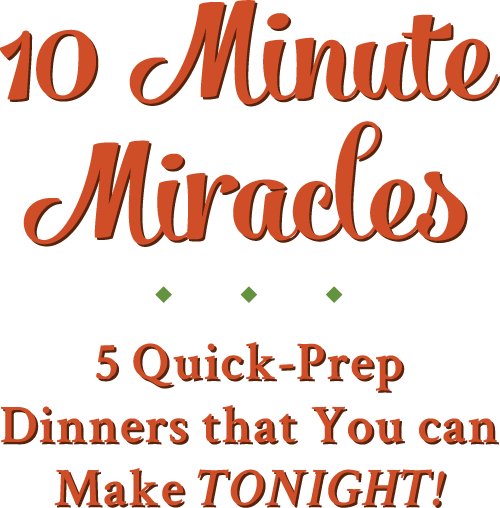 It's an easy meal to prepare in advance, and you can even enjoy leftovers cold! Don't want cabbage on your tacos? Substitute with plain shredded iceberg lettuce instead. This sounds awesome!! Not to be mean, but there is a typo where you say pour marinade over ‘chicken” ! (I know you mean shrimp!) I can’t wait to try it!!! I made this last night and my husband was raving about it! It was delicious! Do the nutrition facts include tortillas? Yumm, who knew an easy recipe like this could taste so good? Thanks for saving us from take out! 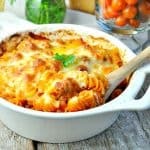 This recipe is definitely being incorporated into a regular one for us! Awesome! I’m so glad that you enjoyed the meal, Amy!